So last week I was shared why self-awareness was so important to learn in life! It’s the most effective method for learning about yourself, your needs and your potential than anything else you can do to learn about yourself. As work fundamentally changes, your very survival depends on your ability to manage yourself. Self-awareness teaches you how to do it more effectively. As a quick review, I define self-awareness as being honest with yourself, but not judging yourself. It’s about observing your thoughts, habits, and actions as if you were watching yourself and understanding the consequences to those behaviors and how them align with who you want to be and where you want to go in life. 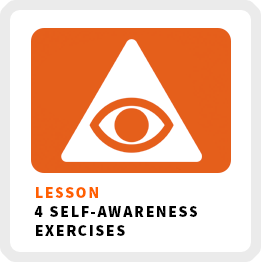 So how do you practice self-awareness and use it to learn about yourself? The goal of this self-awareness exercise is to get your thoughts out of your head and into the world on a piece of paper or a screen. I believe a daily writing habit is the msot effective self-awareness habit. When you write down your thoughts and feelings, it gives you the opportunity to communicate with your subconscious mind. When you go back over what you’ve written over the past week or several weeks, you get to see patterns and trends in your thinking your conscious mind might overlook. You cna start your daily writing habit journaling about whatever comes into your head. Self-Reflect: What did you learn about yourself today? Connect: Did you meet someone new today? Create: What impactful work did you create today? Skill: What skill or concept did you learn today. I refer to this method of journaling as my “Daily Growth Journal“. #2 Be aware of your strongest reactions. Probably the simplest self-awareness exercise to try is monitoring your strongest reactions. This exercises gets you to connect with your inner voice and your gut feelings. You want to become aware of your “snap reactions” or when you react without even thinking about it. This goes for both positive and negative reactions. At first, don’t worry about the source of these reactions. Just be aware that they are occurring. As you get better at recognizing these reactions, then start looking for patterns and trends to idenitify the triggers. You might also want to ask yourself if these reactions are productive or unproductive in terms of the goals you want to accomplish. #3 Monitor your most negative and positive feelings. Toward the end of your day, write down your most positive feeling of the day and your most negative one. Include as much detail about when it occurred as possible. With whom or who was it about? Can you think of the sprak that caused you to have that feeling? As time passes, review these feelings to identify trends and patterns. These feelings might provide clues as to what energizes you and what drains you. #4 Pay attention to just one aspect of your life you want to change. If there is one area of your life you want to change, start by brining awareness to the habits that surround that aspect of your life. For example, if you want to eat healthier, first monitor your eating habits without judgement. Then state your goal for how you would like to eat. Finally, assess the eating habits you need to start adjusting, so you can achieve your goal of healthy eating habits. Self-awareness is the mechanism that helps us being our habits into alignment with the goals we’ve set for ourselves.